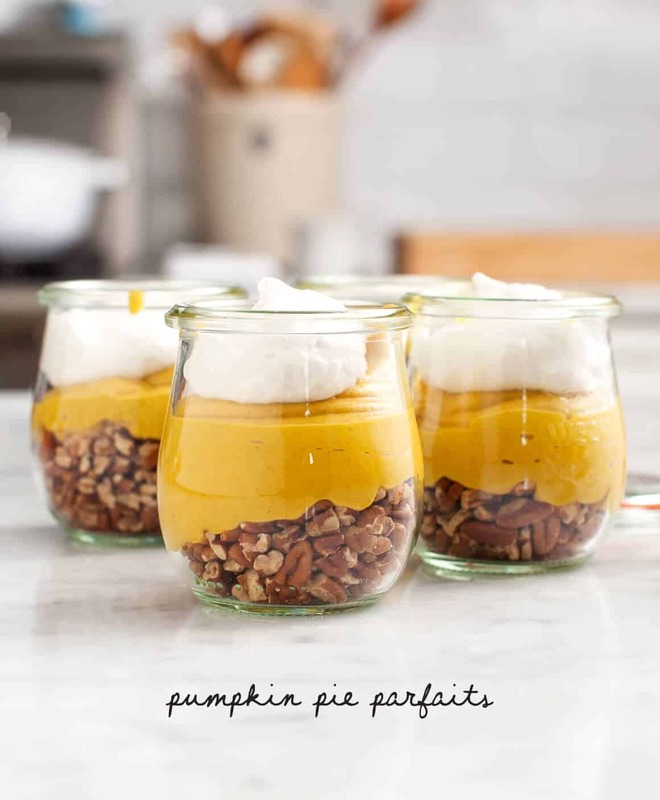 Vegan Pumpkin Pie Parfaits are a creamy, yummy healthier Thanksgiving dessert. Gluten Free. As a kid, my favorite thing about Thanksgiving was hands down, the pumpkin pie. After the turkey was all done and the green bean casserole was divided into tupperware containers, the desserts would come out and my grandpa Donofrio would yell in a high pitched voice “Puuuuuuunkin Pieeeeee!” Always without the “m” sound because that’s the way my sister and I pronounced it back then. Years later, I would learn to prefer apple pie for dessert, but while my grandfather was at the table, his energy for pun-kin pie was infectious and this moment was the highlight of our holiday. 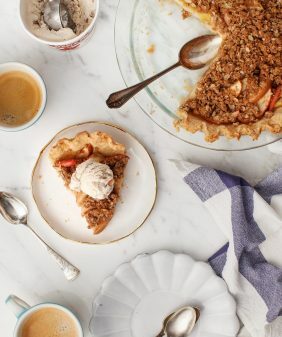 But here comes the less charming part of the memory: we’d all sit around eating our pie, but my sister and I (being the picky eaters that we were) would scoop out the creamy pumpkin middle and leave the shells of our crusts behind. The adults would shake their heads. Sometime’s I’d eat the crispy edge piece, but the soggy bottom crust? No thank you. Which brings us to pumpkin pie parfaits! It’s what crust-less dreams are made of. This recipe comes with a few options. I tested these a few of different ways and honestly both of these taste so good that I couldn’t choose a winner. 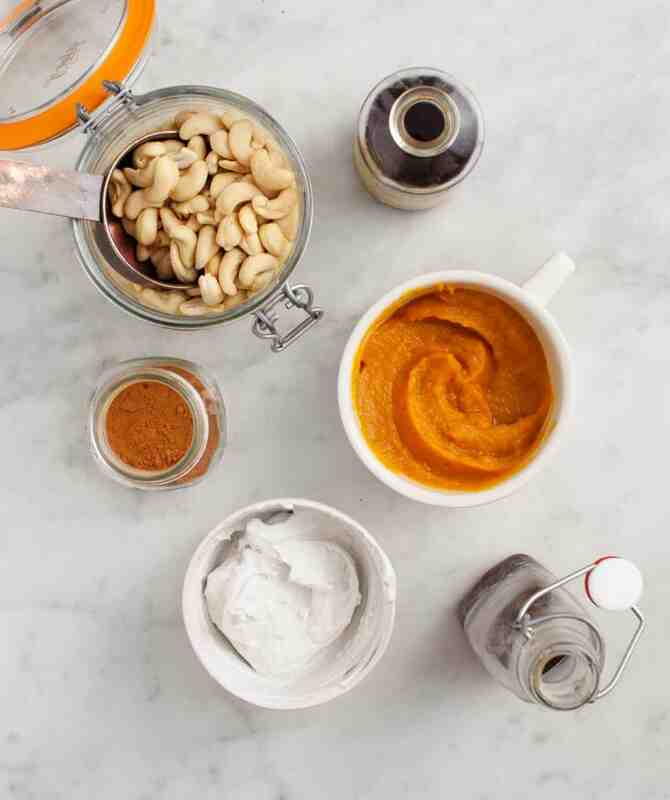 One option uses cashews and coconut milk as the base and requires the use of a high speed blender. The other uses coconut cream and will work with any blender or food processor. In lieu of crust, I layered these with toasted chopped pecans. They are so easy and delicious, even if they are a bit of a modified tradition. Blend all mousse ingredients together until smooth and creamy. Transfer to a bowl and chill for 4-6 hours or overnight (the mousse will be thicker if it sets overnight). To assemble the parfaits, divide the pecans evenly between 4 small serving dishes. 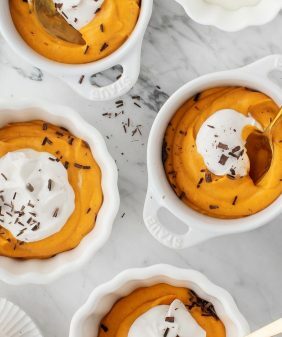 Add the pumpkin mousse and dollop of coconut whip to each serving. *Refrigerate 1 (14-ounce) can of coconut milk overnight. Scoop thick solids off top. Note: this recipe fills 4 (3-inch) small jars, double the recipe to fill larger jars or to serve more. Are those the Weck tulip jars? So nice to see a recipe without crust. I can’t afford those extra calories. 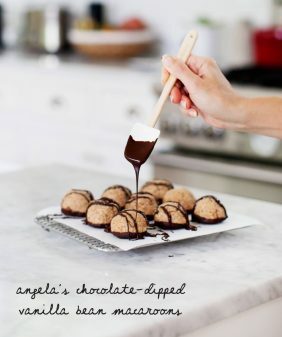 Would this work with regular whipping cream? Hi Joanna, you can use regular whip cream on top for sure. I’m not sure if it would be as thick for the filling (something creamy like mascarpone would be delicious instead of the cashew or coconut solids)… but let me know if you give it a try! 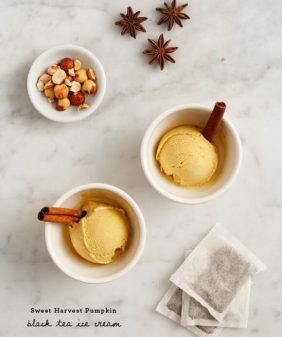 I’ve saved it to my Pinterest board, plus printed out the recipe. I’ll add those changes on the side. I’ll definitely let you know how it turns out. This looks awesome! I might want to try it in a trife dish- to feed a crowd! I hate when the bottom crust of pies are soggy too. No thank you! Haha! Pumpkin pie is one of my Thanksgiving faves too! having trouble getting the coconut cream to whip up – any tips? can was chilled overnight, can it be whipped in a blender? otherwise – its delicious. we made the first version, would love to try it with the coconut whip!!! oh no! Sometimes there are (sadly) dud cans – if you have a few teaspoons of some kind of starch (tapioca, arrowroot, etc), you can whip that in and it’ll help it thicken. I also think some brands are better than others (I’ve been having good luck with the Whole Foods 365 brand coconut milk). When you open the can it should have a super thick layer of solids that easily separate from the watery part. Also, make sure it’s full fat (not light). These look incredible! What a genius idea! I made this tonight and it was amazing. Can’t wait to make it for Thanksgiving. Really amazed out how creamy the mousse was. I used aquafaba for the vegan whip topping instead of the coconut whip and it went well with this dessert. Thank you for the great recipe! Hi Sarah, I’m so glad you liked it! It looks gorgeous.I will try this tomorrow using option 1 for the pumpkin mousse. Thanks for sharing! I made both versions tonight and they were great! I found the consistency of the first version to be really nice and smooth. I had to work the second one a bit longer to get the thicker coconut solids to come together in my Vitamix. Hi Meg – so glad you liked it (sounds like you had a really good thick can of coconut!). 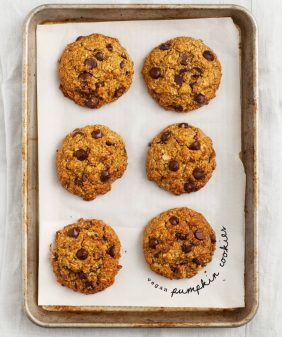 I kept mine for about 4 days in the fridge – they should last until Thanksgiving! 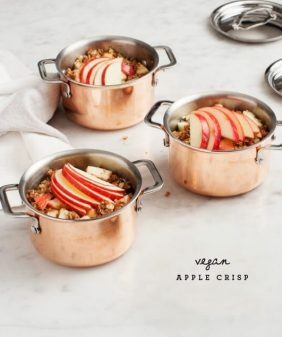 Even with Thanksgiving being over, I still plan to make this for my vegan, food-loving roommate! It looks delicious. These were a huge hit at a recent potluck. I’ve been asked to make them again for Christmas dinner.